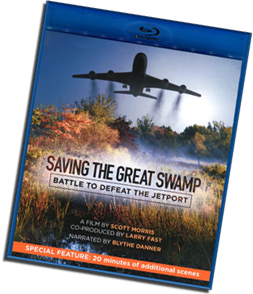 Saving The Great Swamp: Battle to Defeat the Jetport is a new one-hour documentary about the events, people and politics behind the struggle to preserve a rural area of New Jersey between 1959 and 1968. The fight began when the powerful Port of New York Authority announced plans to construct a huge 10,000 acre "jetport" 26 miles west of New York City in a little-known place called the Great Swamp. In the name of progress, entire towns would be obliterated, the aquifer and wildlife destroyed, and a way-of-life threatened for thousands of people. The events that followed became one of the most defining environmental confrontations of its time - a grassroots movement that started in a local high school and grew to historic proportions. It was a battle that took almost a decade, a President and an Act of Congress to stop, and ultimately led to the creation of a national treasure - the Great Swamp National Wildlife Refuge. 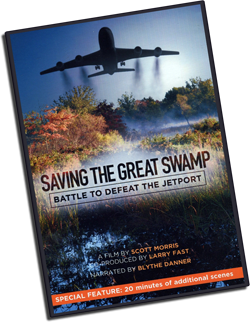 Two years in the making, Saving The Great Swamp: Battle to Defeat the Jetport was produced and directed by award-winning filmmaker Scott Morris, co-produced by Larry Fast and narrated by Blythe Danner. The film features in-depth interviews with residents, historians and officials, and a rich visual tapestry of historic film footage, old photographs and high-end cinematography of the Great Swamp today. The inspiring story continues to resonate as a model for community action in the face of powerful forces.